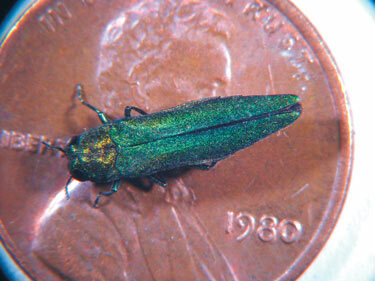 Emerald Ash Borer (Agrilus planipennis) (EAB) has become established in several mid-western and eastern states, but this destructive exotic invasive insect is not known to be present in Texas at this time. In order to be prepared for the arrival of this pest, a multi-agency EAB task force was formed in December 2008 to develop plans for detection and response to this beetle should it be found in Texas. In cooperation with Dr. Stephen Clarke, USFS Forest Health Protection, an EAB Preparedness Plan was developed and reviewed by state agency stakeholders (members of the Texas Invasive Plant and Pest Coordinating Committee). TFS developed a one-page flier (in English and Spanish) to alert the public about EAB and the threat it poses to ash trees in Texas. Texas AgriLife Extension monitored 198 EAB traps at 76 locations in central and east Texas in 2009 and no EABs have been collected. You can find the 2010 update on the trapping program here and here. The Texas Forest Service and AgriLife are interested in new locations of this pest and encourages landowners, arborists, and others to visit www.texasinvasives.org or contact Ron Billings (rbillings@tfs.tamu.edu) or Charles W. Helpert (C-helpert@tamu.edu) to report infestations.